50% off storage for up to 8 weeks. At the junction of A4019 Tewkesbury Road and Kingsditch Lane, Safestore Self Storage in Cheltenham is located in Centrum Park by Dunelm Mill, accessible by buses 41 or 42. The store is purpose-built and is next door to Homebase and near McDonalds. At Safestore all your things are kept safe from harm with our 24 hour recorded CCTV and intruder alarms. As the only key holder, you have unlimited access to your room during opening hours. We have a range of different size rooms available ranging from small lockers to large units. Every room can be rented short or long term. Get in touch with us today to find out how we can help. We have a range of storage solutions at Cheltenham Safestore, whether you are moving house or just need some space to store your things. Use our storage size tool to help you decide what you need. 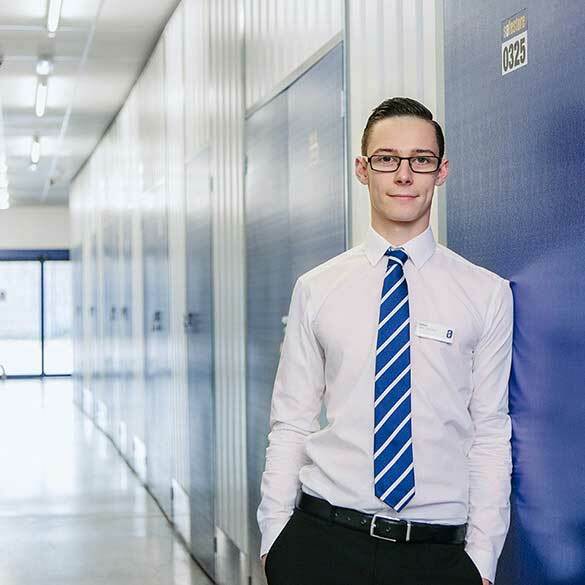 Get 50% off storage for up to 8 weeks at Safestore Cheltenham with no minimum stay. Offer available at all UK Safestore centres. Get a storage quote at Safestore Cheltenham today and reserve a unit for free. When you move in we won't need a security deposit either. Get 20% off at Safestore Cheltenham if you agree a stay for longer than 12 months. Terms apply. Excellence service within 5 minutes I had my space reserved, very good location and 24 hour access to my possessions. Would certainly recommend them. Extremely efficient and helpful. Wuold definitely use them again. Helpful and patient. Clear explanations of all rules and safety systems plus access. Jemaine (from headoffice) and Natasha (from Cheltenham store) gave me top notch customer service. I highly recommend Safestore. I recomendable Safestore! Great customer service and very efficient. Alan & Louise were friendly and very helpful in helping us select the right storage space for our belongings. We still have a very warm greeting from any of the staff at Safestore Cheltenham. Rented a unit to small, and on move day let me get bigger unit with no fuss whatsoever, highly recommend. Everything was in place to store our possessions safely. Friendly, efficient people and an excellent service really taking the stress out of moving by offering great peace of mind. Straightforward and easy to deal with. The unit is clean, well lit and very easy to access and use. Just what I wanted. Very helpful and polite would had given six sstars if i could. Alan and Louise were extremely helpful, and we were able to get exactly what we needed, and quickly. Thank you for taking the time to feedback on your experience in our Cheltenham branch. I'm pleased that you found the process simple. Your comments will be shared with the Store Manager and her team. Trusted and reliable removals service.